Kee Safety LLC is currently working on making non-compliant safety handrail compliant! With a fabricated roof handrail that is currently 900mm high, Kee Safety has been helping to provide a solution to make this existing handrail compliant. By extending the height of the handrail from finished floor level to 1100mm high by using a combination of our unique Kee Klamp A10-8 ‘add on’ fitting, together with the 15-8 and 10-8 and an engineered design, we have been able to ensure the handrail will be safe and secure. 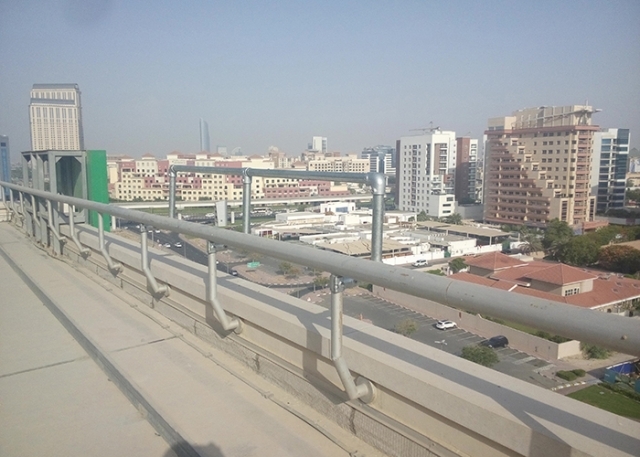 The simplicity of the solution, with no hot works, welding or fabrication, means that the handrail system will now meet all the necessary compliance criteria. Kee Klamp fittings are hot dip galvanised and TUV approved, this, together with an optional Powder Coated finish will ensure that a Safety Handrail on the roof is fit for purpose and fully compliant.